Hazelnut | Gurney's Seed & Nursery Co. 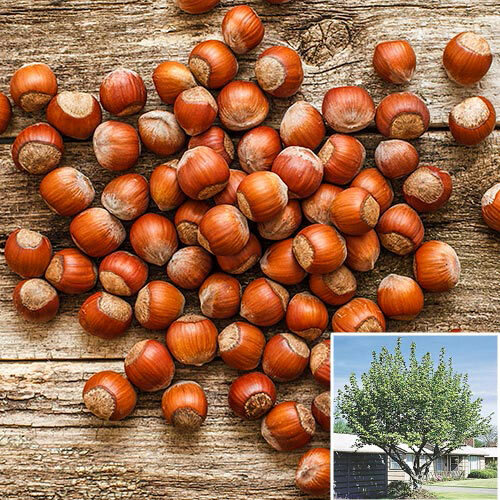 Huge yields of large, high-quality hazelnuts! Bigger than other varieties, Jefferson and Theta Hazelnuts have a delicious buttery flavor that is perfect for both savory and sweet recipes. Exhibits good resistance to pests and exceptional resistance to Eastern Filbert Blight. Plant in very moist, fertile, well-drained soil for best results. A full-sun to part-shade site should be chosen for optimal results. Choose two varieties for pollination. Potted. Zones 5-8. Height10 - 12 feet, but it can be maintained as a smaller shrub for easy harvesting. Flower Form1.5 - 3 inch male catkins in April. Female flowers insignificant. FruitLarge tasty hazelnuts that consistently fill-out their shells. Soil RequirementsVery moist, fertile, well-drained soil. PollinatorChoose two varieties for pollination. CommentsHUge yields of large, high-quality hazelnuts! Bigger than other varieties, Jefferson and Theta Hazelnuts have a delicious buttery flavor that is perfect for both savory and sweet recipes. Exhibits good resistance to pests and exceptional resistance to Eastern Filbert Blight. Plant in very moist, fertile, well-drained soil for best results. A full sun to partial shade site should be chosen for optimal results. Choose two varieties for pollination. YieldHeavy yields, 20+ lbs. at maturity.